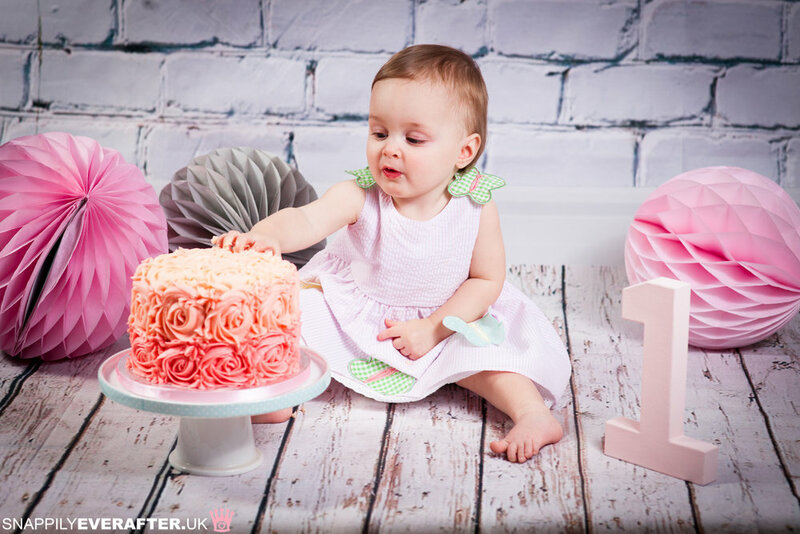 Cake smashes are an ideal way to celebrate 1st birthdays and to give your child a chance to make a complete mess. Let me bring the studio to you! I will bring all of my equipment to your home. This means that your tot will be in familiar surroundings so there will be less chance that they will become camera shy. It usually takes me 20-30 minutes to get set up with the actual session lasting about 20 minutes. On average I will take about 200 photographs. I then whittle the final cut down to 50 images which are then re-touched and beautifully enhanced ideal for printing or showing off on social media. I provide the backdrop pictured above but can also provide plain blue or pink. I have blue and pink bunting but if you want to decorate the back drop yourself with balloons or anything else you would like then fill your boots! Prices include the cake pictured which is vanilla sponge, filled and coated with vanilla buttercream. Cakes can also be chocolate sponge filled with vanilla buttercream (any colour) or chocolate buttercream. Cakes can be gluten free if requested and if you require an egg/dairy free cake then this will cost extra. All cakes are nut free and are provided by Debra's Cup Cakes which are registered, fully insured and have a 5 star hygiene rating. So in summary, for your money you will receive a cake and 50 edited digital images. The images will be the highest resolution possible, ideal for canvases or prints. Depending on where I have to travel to, there may be a small fuel surcharge.